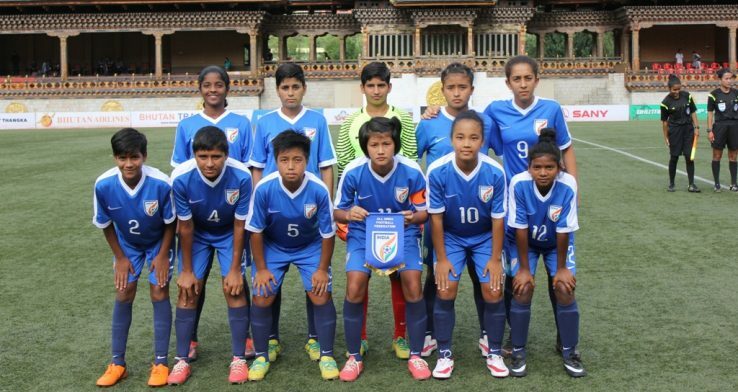 The Indian U-15 Women’s National Team rode on Shilky Devi’s hat-trick to kick-start their SAFF U15 Championship campaign by a thumping 12-0 win over Sri Lanka at the Changlimithang Stadium in Thimphu, Bhutan today (August 09, 2018). A dominant attacking performance saw the Indian Women register an easy win, scoring six goals in the first half and six again in the second; courtesy of a Shilky Devi hattrick (1’, 20’,44’) and strikes by Lynda Kom (6’), Avika Singh (13’, 58’), Sunita Munda (42’, 79’), Kritina Devi (47’), Kiran (72’) and Anju (87’,90’). The floodgates opened in the very first minute itself when skipper Shilky Devi found the back of the net from close range. Shortly after in the 6th minute, Lynda Kom smashed her chance into the back of the Sri Lankan net to double India’s lead. The Indian Women playing poise and determination restricted Sri Lanka to their half and fostered chances at will. In the 13th minute, Avika Singh’s long-range attempt left the opposition custodian bewildered and found the back of the net to triple India’s advantage. Shilky Devi added another in the 20th minute to make the scoreline read 4-0 as India upped the ante and all but secured the win. In the 32nd minute, Priyangka Devi’s cross from the right flank was met by Sunita Munda’s header but her attempt brushed the side netting on its way out. In the 42nd minute, Sunita Munda netted the ball home to make it 5-0 and skipper Shilky Devi completed her hattrick in the 44th minute to make the scoreline read 6-0. With the Indian defence almost remaining untested throughout the first half, the Indian custodian was not forced to make a single save. The half-time scoreline read 6-0 as the Indian Women led fashionably over their opponents. Changing over, the Indian Women continued their dominant attacking momentum and in the 47th minute made it 7-0 when defender Kritina Devi found the back of the net. Avika Singh’s shot from distance crept into the bottom corner of the Sri Lankan goal after some tacky midfield play to make the scoreline read 8-0. Substitute Kiran joined the fray of goal scorers and found the net from inside the box in the 72nd minute to add more to Sri Lanka’s worry. Sunita Munda added more gloss to the scoreline in the 79th minute and Anju’s strike in the 87th minute and 90th minute completed the rout as the Indian Women defeated Sri Lanka 12-0.